I have never played a game in the Call of Juarez franchise; For me they all seemed like bad first person shooters about drugs, or something like that. I've heard and read good things about this one and I decided to give it a go. I'm pretty happy that I did, it's a pretty good game and the 15$ price tag makes it even better. Call of Juarez: Gunslinger is more than just a first person shooter, they added things here and there to make it more interesting than the average firing gallery and made good on many original ideas. First of all, I really enjoyed the level up system; You get experience by performing stylish kills in tons of different ways. For instance, killing someone by shooting him in the stomach will net you 50 experience points but sniping someone with your colts while you don't have any more life and it's your last bullet will award you 300 instead. Maybe I would've liked a way to see all the bonuses you can get in the game so I would know what other moves to try. Killing multiple enemies in succession will rack up combo multipliers, which is made easier by the slow-motion mechanic that you accumulate by killing enemies and then can slow time for about 5 seconds, giving you all the time you need to line up a streak of headshots. There are some sequences in which you have infinite slow-mo and they're great to rack up the experience. There are many other ways to refill your slow motion meter and you unlock them through skills. The skill system is also well realized. You have three 'skill trees' which correspond to your type of weapons. There's one for dual-wielding pistols, one for shotguns and one for the rifles. You unlock special bonuses such as finding more ammo on your enemies, deflecting 1/5 bullets, getting more 'concentration' (the slow-motion mechanic) when you get headshots and so on. You also unlock better weapons by going down the trees, there are 6 of them to unlock and they are sidegrades of each other, one might have 25% more range and 30% less recoil, but the other will have 50% more rate of fire. This is great, except that you need to find these weapons after you've unlocked them and you lose them at the start of each level. The story is also pretty good and the devices used to make you interested work well. The narrator is unreliable enough that you're always wondering about what you're doing. At some point I was pretty disappointed because I seemingly failed an event that I thought I did perfectly, only to be told that most of what I just did didn't happen at all, and that was pretty funny. There's also a New Game+ where you can make slightly different choices. The game is a bit difficult even though it tries to give you as much help as you can get, you have the slow-motion mechanic and another one called 'Death Sense' which allows you to dodge a bullet that would kill you if a meter is filled (it fills over time). I like that idea, but you get shot by so many enemies at once that maybe dodging that bullet will save your life, but in most cases, it wasn't for long. 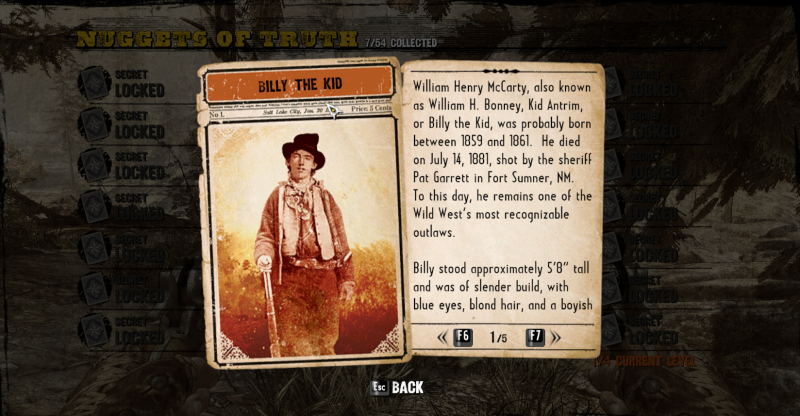 You also find 'nuggets of truth' about the real character, locations and events of the old west. They give a chunk of experience as well and they're fun to read if you're slightly interested with the fiction. Usually they're located in hard to reach places or off the beaten path, but a skill can help you locate them. Collectibles with some redeeming qualities such as making you learn about random trivia are pretty good. I had a few issues with CoJ:G. The first one is the difficulty, even on easy, I thought it was pretty tough to navigate these encounters, getting shot by dozens of dudes placed around in the environment that seemingly won't miss and then the screen gets filled with bullet holes. You have to take cover to regenerate your bullet-hole-screen but trying to shoot while you're getting shot is pretty difficult. The bullet holes taking so much space on your screen is really distracting. I don't like cover-based shooters because they make not much sense. Someone is shooting at me while I'm behind cover, so I pop out when they reload and shoot at them, why are they shooting at me if I'm invincible behind that piece of wood? Some sequences have you punch the WASD keys, QTE style, to kill a bunch of enemies that are ambushing you. They don't give much time and I failed them often, bumbling around, trying to find where the A key was. If you fail at one of them, you have to fight the whole bunch of enemies the 'normal way.' Maybe giving more time or allowing you to try on the other foes if you fail the QTE on the first one would fix this. The duel system is painfully bothersome. At the end of some stages, you have to fight a duel against one of the story's bosses. The basic idea of the duel is that you keep your mouse cursor on your enemy to build up focus and you move your hand with the A/D keys so that it stays the closest to your gun as possible. When you hear your heartbeat, you can shoot but will be remembered as a coward, when the enemy moves to pick up his gun, it's your cue to shoot. They mix it up a little with Mexican standoffs and duels where you have to dodge bullets, but that's the basic concept. Sadly, the mouse cursor is extremely floaty and your opponents moves left to right constantly, so you have to keep your cursor always moving like it was in a vat of jello. Moving your hand with the keys at the same time is distracting and you're never sure if you're close enough to your gun to have a good 'speed' rating. When your opponent picks up his gun, you click to pick up yours, aim with a very floaty reticule and try to hit them. If you messed up the hand part, they shoot you first, if you messed up the focus part, you can't aim and they shoot you, if you didn't perform well enough, you shoot them as they shoot you. It's not fun, the controls could be less floaty and the hand movement could be better explained, even at the end of the game, I wasn't sure what to do. I really liked Call of Juarez: Gunslinger, it was a bit difficult but the upgrades I got made the game better and better as I went forward, the story kept me interested until the end and the mechanics were good enough to differentiate the game from other first person shooters. Time to continue that New Game+!